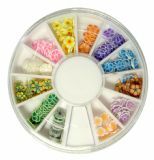 Nail art canes are a fantastic product that you can to use different ways! 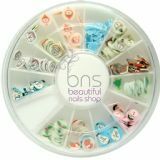 Make a complete nail art design using a single or multiple designs together, or use you can enhance a nail art design by adding a single or half a slice to the nail, creating a more unique nail art design. Made with a ceramic clay, nail art canes are durable which makes them very easy to work with. 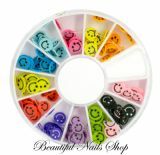 Nail art canes can easily be embedded into acrylic and gel applications for long lasting designs, or added to the nail art design with simple topcoat to seal. Larger nail art shapes can be glued on for longer lasting nail designs. These Simple, easy and quick ways that you can apply nail art canes helps you to achieve many different inspiring designs in an instant.